Ellie Forcella's, one of our favorite restaurants, is closing tomorrow. My parents ate dinner there last night and the server told them that Friday would be their last day. The owners apparently received an offer they couldn't refuse. I'll be sad to see it go. Ellie's had an excellent menu. It actually changed quite often but the new dishes were always just as good if not better than the ones they replaced. Their salmon was especially tasty and several of the pasta dishes were great too. They used to have an awesome appetizer which consisted of fried tomatoes, blue cheese and balsamic vinegar but they removed it from the menu a few years ago. The owners of Ellie's also operate three other restaurants; Blue Water Grill, Big Sky Cafe, and Remy's Kitchen & Wine Bar. Restaurants seem to come and go. I'm sure we'll find another new favorite to take Ellie's place. We went to the Lynyrd Skynyrd / 3 Doors Down concert last night at UMB Bank Pavilion. I really like Lynyrd Skynyrd's music and have several of their CD's so, when I heard the concert announcement on the radio several months ago, I told Bill about it. He wasn't really enthused until I told him that 3 Doors Down was also performing. We bought tickets the first day they were on sale and we had really great seats...10th row! There was a warm-up band but we sat outside the pavilion until they were finished. I have no idea who they were and I hate having to listen to songs I don't know by people/groups I've never heard of. Anyway, 3 Doors Down took the stage at about 7:50 or so and played for about 90 minutes. They were really good. I'll have to listen to Bill's 3 Doors Down CD's more often. Lynyrd Skynyrd came on stage at about 9:30 and also played for 90 minutes. It was great to hear Gimme Three Steps, What's Your Name, Sweet Home Alabama and Freebird all being sung live! For you C&T fans out there, I think there was a Captain & Tennille connection at the concert last night. One of the horn players was Jim Horn. For you non-C&T fans, there was a Jim Horn who played on the song 1954 Boogie Blues which is on C&T's second album entitled Song of Joy. I'm pretty sure it's the same Jim Horn. If anyone can confirm this, please let me know. We saw the King & I at the Muny last night. We had seen it before but that was way back in 1994. I had forgotten that the King dies at the end. A couple of people sitting near us were actually crying so, of course, that made me giggle...hee hee hee. Leslie Denniston played Anna Leonowens and she has a very pretty singing voice. We've seen her in quite a few Muny productions such as The King & I (1994), My Fair Lady (1996), Three Coins in the Fountain (1997), Side by Side by Sondheim (1997), Meet Me in St. Louis (2004) and The Sound of Music (2005). I guess you could say she is somewhat of a Muny staple. Francis Jue played the King and he gave an excellent performance. All of the King's children were cute, especially the little one. Overall, it was a great performance. We ate at the Culver Pavilion before the show. We usually eat there at least 5 or 6 times during the season but, this year, we've made reservations for all 7 shows. It is catered by LoRusso's Cucina which is an Italian restaurant on The Hill. The food served at Culver is really good and it's very convenient when attending the Muny. You have to have season tickets or be with a season ticket holder in order to dine here. Anyone visiting St. Louis during the summer should be sure to attend a Muny performance. You won't be disappointed. Today was the first day of summer and there was no doubt about it when you stepped outside. It was 95 degrees and quite humid. I'm not complaining, though. I'll take heat over cold any day! The only bad thing about the first day of summer is that it is the longest day of the year. While that in itself is not bad, the fact that the days are now getting shorter is. I like daylight; the more, the better. I hate when it's dark at 5:00pm in the winter. Oh well, I don't usually notice that the days are getting shorter until the end of August or so. Then it just seems to hit all of a sudden. I designed this card a few weeks ago and thought that it would be appropriate to post it today. 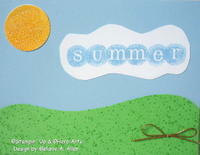 There really isn't a lot of stamping on this card; just the word "summer" and the texture on the grass. Since I love sparkle, I decided that glitter had to be added to the sun. I'm not sure exactly what this card will be used for but It was definitely fun to create. A couple of weeks ago in one of my blog entries, I mentioned that I had designed a few cards and would post them soon. Well, the reason you haven't seen them yet is because they were made for specific recipients and/or occasions and I didn't want the recipient to accidentally see his or her card here before they received it. I'll be sure to post a few of them in the next few weeks though. I'm currently working on a Captain & Tennille note card. I'm not sure why I need a C&T note card but, as I've said before, I'm not sure why I really need this blog either. Anyway, I've had a C&T logo stamp since I was about 15 years old. I had it custom made and I used to use it to make stationery or just stamp it on anything that stood still...hee hee hee. I haven't used it for quite some time so I figure it's time to get it out, dust it off and put it to good use. The 88th season of The Muny began tonight with The King & I. We've had season tickets on Friday nights for about 7 or 8 years now. Before that, we purchased season tickets for several years through Bill's work. The only problem with that was that they weren't the same seats each year. I guess that's not really a problem unless you have seats that you don't want to give up. We've had these same seats now for the past 4 seasons and they're perfect, unless of course some really big guy sits directly in front of us but that's true no matter which seat you're in..hee hee hee. Each year during the last two shows of the season, they distribute a questionnaire asking which shows and performers you'd like to see during the next season. Each year I always write in "Toni Tennille" as the performer I'd like to see. I even suggest that they ask her to star in either Hello Dolly or Mame, both of which she has performed in other cities. I guess they finally got tired of me writing her name in every year and they added her to the list of choices a few years ago. They still haven't asked her to star in one of the shows though (or maybe they have and she declined). Oh well, maybe next year. This season's shows are: The King & I, Aida, The Wizard of Oz, Gypsy, White Christmas, Oliver and Seven Brides for Seven Brothers. Hopefully Friday nights will be rain free! We went to the Tom Petty concert last night at UMB Pavilion. Although I like many of his songs, we didn't really buy the tickets to see Tom. We were more interested in seeing his "special guest." Believe it or not, it was none other than Stevie Nicks! She appeared on stage after Tom introduced his band, approximately 10 songs into the concert. She sang with Tom on "Stop Draggin' My Heart Around", "I Need to Know" (they sang Stevie's rocking version) and "Insider". She also sang backup and played her tambourine on "Don't Come Around Here No More" and "Learning to Fly". During the encore, she sang backup on "American Girl. We haven't seen Stevie since the Bill & Melanie 2003 Fleetwood Mac tour. We saw Fleetwood Mac 8 times that summer; (in order) once in Nashville, twice in St. Paul, and once in Las Vegas, St. Louis, Biloxi, San Antonio and Houston. What fun! We ate at another new restaurant tonight. Mosaic is a "modern fusion" tapas restaurant and it's wonderful. The "small plates" are meant for sharing. We tried the soup flight, three cheese cold tapas, beef tenderloin, artichokes, gnocchi, and sea bass. It sounds like a lot of food but remember, they're "small" plates...hee hee hee. We had the chocolate pot of cream for dessert. They also had my new favorite beer on tap, New Belgium Brewing's Skinny Dip. Another great restaurant in downtown St. Louis! I'm adding it to my favorites and we'll definitely be visiting Mosaic again soon. Can it be? Was it really 20 years ago? Believe it or not, yes! 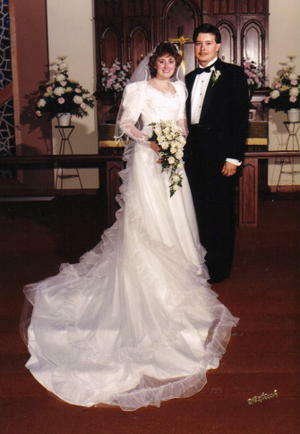 Bill and I were married 20 years ago today. It seems impossible that we've been married two decades...almost half of our lives. We have a visitor. 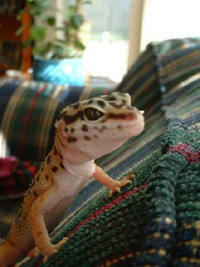 His name is Slinky and he's my nephew's leopard gecko. He'll be staying with us for a few weeks while my sister, brother-in-law and the kids are on vacation. We put his cage in the office room since we normally keep that door closed and the room tends to be the warmest in the house. I think our kitty, Greta, being the typical curious cat, suspects that there's something different behind the door. Since cats and gecko's don't mix, Greta won't be spending any time in the office room during Slinky's visit. He can happily munch on his crickets and meal worms in peace. Check it out...Toni Tennille is blogging! How cool is that! She says that it will be a "weekly column of thoughts and musings"...hmmm, musings, I like that...hee hee hee.